Oversteeped Earl Grey tea is what makes Kevin Liu's Teagroni (a riff on the classic Negroni, pictured above) special. The technique is simple enough: steep two tea bags in a small quantity of water for a long time. This steeps the tea and concentrates flavor as you let about half the water evaporate. 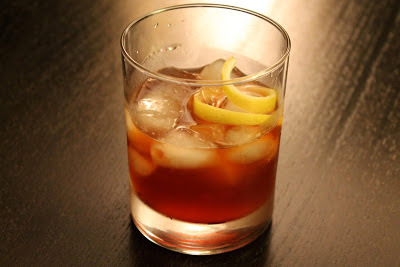 Below is his recipe for a Negroni and my own creation with bourbon and lemon. Heat the honey and tea extract in the microwave ahead of time to dissolve the honey. Stir all ingredients with ice. Garnish with orange twist or spritz of orange extract. 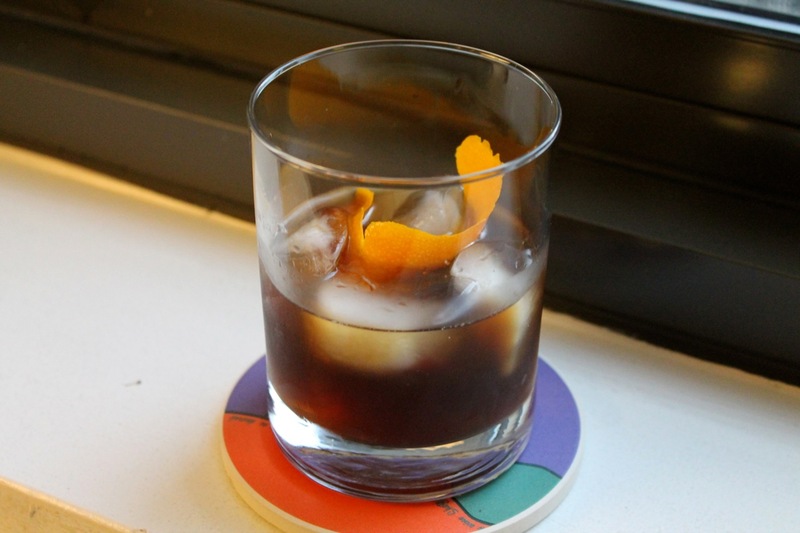 A Boulevardier is a classic Negroni twist made with bourbon (or rye) instead of gin. Here, I also use the oversteeped tea and honey from the Teagroni. A Boulevardier is often served up but I did it on the rocks. Heat the tea and honey ahead of time in the microwave to dissolve the honey, stir and allow to cool. Combine ingredients (except the twist) in a cocktail mixing glass with ice. Stir until cold and strain into a rocks glass with ice. Garnish with lemon twist. This recipe makes about 4 oz. of tea, which is enough to make four of the above cocktails. Liu says the technique works with any tea, including green tea, but suggests Earl Grey for the Teagroni, which is what I used for both of the above drinks. Simmer the tea in the water until the liquid reduces by half, approximately 10 minutes. Make sure to squeeze the filter bags of their remaining goodness. Store in the refrigerator (Liu suggests it should keep for a long time due to the antioxidant properties of tea). These were some of the most interesting drinks you've made. Tea in cocktails. Who would've thunk?